Give Skin A Treat With Our Award-Winning Facial Serum. - Amphora Aromatics Ltd – Supplier of pure essential oils and aromatherapy Products. Give Skin A Treat With Our Award-Winning Facial Serum. Relax and unwind over Easter with our award-winning Scienea Superberry serum - the perfect treat for skin. is made from 100% natural ingredients and smells delicious!! Superfood for your skin, Scienea Superberry is formulated with clinically proved natural ingredients to help reduce fine lines, wrinkles and ‘crow’s feet’ as well as boost skin elasticity. Paraben-free, the serum contains more than 20, independently tested, natural ingredients. 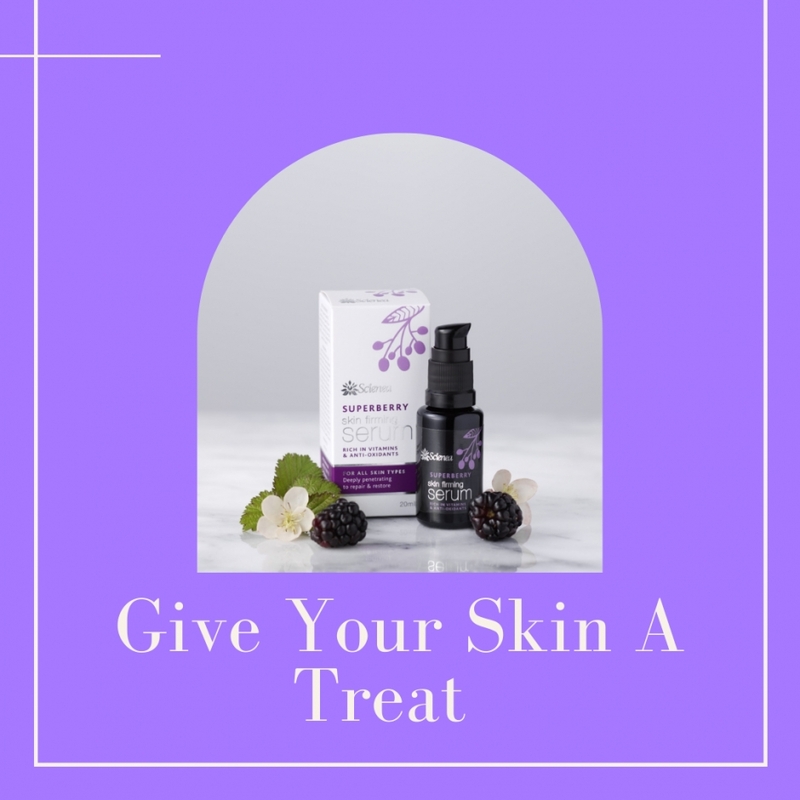 Out to help reduce signs of ageing, Superberry is one of two Scienea facial serums – rich in vitamins and anti-oxidants and formulated with pure essential oils, super fruits and berries for all skin types. Each serum retails at £30 for 20ml. Penetrating deeply to boost the natural defences of skin, this anti-inflammatory formula contains a natural active ingredient, Collageneer, clinically proven to improve skin elasticity and firmness. With regular use, the natural ingredients in Scienea’s Superberry can help increase elastic recovery and skin elasticity after 89 days use and lead to a decrease in volume of jowels (loose skin under jaw) after 42 days application. Scienea’s Superfruit anti-ageing serum is made from 100% natural ingredients. Containing a rapid, effective, clinically proven and wrinkle smoothing natural active ingredient, Gatuline In-Tense, the serum acts on the skin’s lifting properties – giving skin a natural ‘lift’ and enhancing skin density and firmness. Scienea’s Superfruit starts working from the first application and the skin’s wrinkle surface may be reduced by 52% after the first application. Results are even clearer after 28 days of treatment, if used twice a day. Scienea’s pump action dispenser is easy to use. Clean and dry face, gently apply two pumps of serum with fingertips and massage into skin, morning and night. Allow time for serum to be absorbed before applying moisturiser. Here’s what some of our pre-launch testers had to say about Scienea’s Superfruit anti-ageing serum. “I enjoyed using this serum. It is light and easily absorbed and feels immediately good on the skin – and very easy to apply with the pump action. My daughter thought my face seemed more filled out with less lines. Often used it just on its own and it was still effective. I think it is good value for money, given the variety of natural ingredients.” Jane. “The serum is a treat to use; it is not greasy on application but spreads smoothly over the skin, making it the ideal base for make up in the morning. At night, the oil is nice and light and massaging it into the skin after cleansing releases the luxurious fragrance – a suitably pampering end to my night time routine.” Victoria. “I think the serum is great as the smell and the feel are instantly uplifting and the softness of the face really lasts all day or night. A big ‘feel good factor’ and sense of well- being and it actually seems to work, as well as knowing it is natural and good for you – I worry about chemicals in many cosmetic face creams – but not this one. Very easy and convenient to use, I like the dispenser and the clear instructions of two pumps per application”. Katie. “I enjoyed trying this serum and felt it was good for my skin. It gave my skin a glow and a new softness to it, especially just after use. I would without hesitation use this serum again would give this product as a gift.” Sara. For more information and to order click here - Scienea.